But they just didn’t work. 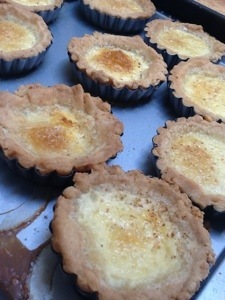 I normally make a large custard tart, and I’ve never been really happy with that either. Never quite got the pastry right. Also a pain to lever out of the dish, and you have to have it on a plate, blah blah blah. Tartlets seem like an easier way to eat them. I got some Bakers Delight tartlet cases from Peter’s of Kensington, and that shop is a whole ‘nother blog in itself. They have a little disc in the bottom that allows you to push the tartlet out of its case, and they worked very well, they can stay in the recipe. I was also happy with the pastry. I went back to the 1970 Women’s Weekly cookbook, an essential guide for any housewife, and they suggested using a Biscuit Pastry. And how right they were. Here’s the recipe for that. Beat butter until creamy, add sugar and beat until just combined. Apparently overbeating at this stage will make pastry difficult to handle, like a housewife without her Bex. Work in flour and baking powder. Turn dough onto a lightly floured board and knead lightly until smooth. Refrigerate 30 minutes before using. I thought I’d need one and half times the recipe for 12 tartlets, and I was about right. Yes, I know you can’t get one and a half eggs, I just used a really big one, OK? Now, I don’t know about you, but when I roll out cold pastry, it breaks up and looks a lot more like a Norwegian coastline than the smooth circle in the book, but I charge at it. You want it fairly thin for tartlets, I think mine was a bit too thick at about 4mm. I upend the cases on the pastry and draw a circle around them with a knife about one cm away from the circumference, and this also appears to be about right. Nearly half need to be cobbled together from bits of coastline, perhaps next time I should squash them up and roll them out again. You beat the eggs, vanilla and sugar together while multitasking by heat the milk in a saucepan. Gradually stir the warm milk into the egg mixture. Then, you’ll need to decant it into a jug so you can get it into the tartlet cases without tipping it all over the Caesarstone. It was probably about twice as much custard as I needed, so I put the overflow into two ramekins and baked it too. Bake in a moderate oven for about 15 minutes, then slide them out and grate a bit of nutmeg of each one. Slide them back in for another 15 minutes while you apply aloe vera to your burnt knuckles. Watch in despair as the custard seeps into the pastry, and in some cases, through the holes in the pastry and onto the baking tray holding them up.